IBAN REMIT – a cutting-edge money remittance service for instant settlements in various currencies using unique IBANs. How does IBAN Remit Works? Computer games, multi-level marketing, licensed forex & gaming, financial institutions, card issuers, payroll management (salaries, commissions, bonuses), suppliers & vendors, international traders, freelancers. Being a SEPA member we settle Euro payments within seconds. We also do express same-day pay-outs in local currencies around the world. Other options for money remittance. 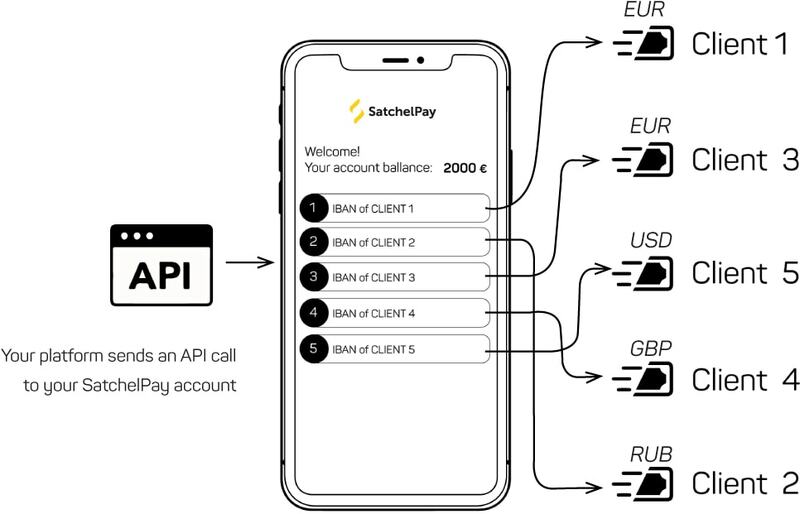 SatchelPay is a one-stop provider for global money remittance services, offering fast payments in 34 local currencies. We empower customers around the globe to use payment methods they know and trust. We remit payments using card-to card payments (OCT), Western Union, as well as more than over 100 eWallets around the world. Financial institutions can enable their clients to send funds using unique IBANs under their names. SEPA Direct Debit – ideal instrument for recurring payments. IBAN REMIT is significantly cheaper compared with SWIFT transactions or OCT.
We enable direct payment reconciliation between our client and the beneficiary of the transaction. Our APIs reduce to zero the workload and time spent on the processing of pay-outs. Each of your customers will pay to a dedicated IBAN of your company. Easy to track payments – all incoming transactions will be credited to a specific IBAN. Your customers will no longer need to enter specific details in payment orders. Just click on a required IBAN and instantly find the payments.